Austin KILHAM (1587 – 1667) was Alex’s 10th Great Grandfather; one of 2,048 in this generation of the Miller line. Austin/Augustine Kilham was born in 1587 in Dennington, Suffolk, England. Austin’s parents were Henry KILLHAM and Alice GOODALE. He married Alice GORBALL on 8 Sep 1619 in Wrentham, Suffolk, England. The Kilhams sailed from England on the ship Mary Anne for New England on 15 May 1637 out of Ipswich, England, William Goose master. Many people assume the ship went to Salem because Austin’s examination record show him as “being desirous to goe to Salem in New England”. In fact, he first landed in Boston on 20 Jun 1637 and then went to Salem where he resided until 1640. He lived at Dedham until 1649 and then established a permanent home at Wenham. Austin died 5 Jun 1667 in Wenham, Mass. Alice Gorball was born in 1598 in Dennington, Suffolk, England. Her parents were John GORBALL and Christian FILBY. Alice died on 18 July 1667 in Wenham, Essex, Massachusetts. 6. Sarah KILHAM 4 January 1642/3 in Wenham, Essex, MA Deacon William FISKE Jr.
7. Elizabeth Kilham ca. 1647 in Ipswich, Essex, Mass. 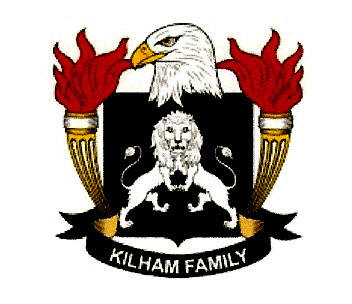 The family name can also be spelled Killham, Killam, Killan, Killiam or Kellum. Alice’s father John GORBALL was born in 1575 in Wilby, Suffolk, England. He married Christian FILBY in 1595 in Wilby, Suffolk, England. Christian Filby was born in 1576 in Wilby, Suffolk, England. Austin (also known as “Augustine”) Kilham came to America on the ship “Mary Anne” in 1637 with his wife and at least 3 children. They lived at Salem for two or three years and at Dedham until 1649. From there Kilham moved to Wenham. It is on record at Wenham that he took letters of dismissal from the Church in Dedham, 14th of the 5th month of 1649, when “Brother and Sister Kilham passed the tryall, and next Lord’s day were taken into the covenant” In 1653 when pastor Reverend John Fiske [William FISKE Sr’s brother] left Wenham and settled at Chelmsford, Austin Kilham and six other heads of families planned to go with him; but for some unexplained reason Austin and one other changed plans and remained at Wenham. “The Founders of New England”, by Samuel G. Drake, page 49 ; “The Planters of the Commonwealth”, by Charles Edward Banks, page 183; Winthrop: Journal, 1, 222; Wyman, Charlestown, 1, 563; and the original list in Public Records Office. Austin was examined May 11, 1637 “as desirous to goe to Salem in the New E”. Both he and his wife being examined sailed aboard the vessel “Marey Anne” of Yarmouth, William Goose, Master. The records show the examination of a “Augusten C- – – – – Alles his wife ageed 40 yeares”. At this particular juncture the ever variable last name is spelled or shown in the original records as a “C”. Due to the poor quality of the original transcript the balance of the name can not be made out. 7 Aug 1637 – Austin was admitted an inhabitant and granted a quarter of an acre of land. He was soon granted a ten acre lot which he exchanged for land on Cape Ann Side. 25 Jun 1638 – Salem Records show Ananias Cocklin, a glass maker, shall have that ten acres of land that was granted to Killam he having it exchanged for land on Cape Ann Side. This land was in what is now Peabody. The glass works was built and made bottles and coarse articles of inferior glass and probably window glass. See Essex Institute Historical Collection Volume 16, 1879 and Perley’s History of Salem. This doubtless was the first glass works in America. 1 Jun 1639 – Austin was granted thirty acres of land. This land may have been in that part of Salem which is now Wenham. Mr. Killam is said to have been one of the first settlers of Wenham, the others being named Fiske and Goldsmith. Spring of 1640 – Removed to Dedham, MA. 2 Jun 1641 – Made a freeman in Dedham. Mr. Killam’s occupation was given as measurer. He was granted several pieces of land in Dedham and served the town in running lines for the division of town lands. 1652 – Mrs. Killam was in court for wearing a silk scarf or hood. This case was continued and appears to have been dropped. 1653 – He was one of the twenty-five persons of Wenham who contributed toward the support of Harvard College but four gave more than Mr. Killam. 1655 – He was one of seven from Wenham who organized the church in Chelmsford, MA under the Reverend John Fiske who had been the pastor of the Wenham Church. He gave liberally toward the support of the church in Wenham and was one of three on the committee to build the church in 1660 and it was built on his land. The present Church and Soldier’s Monument are said to be on land he formerly owned. The name of Austin Kilham occurs among the earliest settlers of Wenham. He is supposed to have come from the West Riding of Yorkshire, where the parish of Kilham still exists, situated near Beverly, the principal market town in that part of England. From this Austin Kilham, all who bear the name of Kilham, which has now become considerably diffused in our country, are supposed to be descended. The family have, at different periods, taken an active and prominent part in the affairs of the town. Second of the 4th mo. 1667. The last will and testament of Austin Killim.I being sick and weak of body yet of perfect memory commit my soul into the hands of the Eternal God and Father in Jesus Christ and dispose of my estate as follows:Imprimis, I give to my well beloved wife all my cattle and swine and moveable goods also I give my dwelling house and land thereunto belonging (except six acres which I have already given to my son Lot) both upland and meadow for the term of her life (unless she shall have the need to sell any of the aforesaid meadow for her use) and then my will is that it shall be my son Lot’s. But if he die before his mother my will is that she shall have the sole disposing of it to whom she think meet. Also my will is that my son Lot shall have five acres of land between Ipswich line and the sawpit unless his brother John shall give him an assurance of five acres in the neck of which my son Lot hath now part in his possession and for the rest of my farm both upland and meadow that is not now in my possession I have formerly disposed of it and my will is that there be no alteration of any part of it unless the aforesaid five acres (by the sawpit) to my son Lot and further I make choice of my well beloved wife to be sole executrix to this my will. Over the years there seems to be a common misunderstanding as to the origins of the Killam/Kilham family. Some researchers have written that the family place of origin is in the parish of Kilham, Yorkshire, England. Others have written that the family’s origin is in Bury St. Edmunds, Suffolk, England, and then they moved to Dennington, Suffolk, England. George Staley Brown in 1898 seems to have copied this mistake from Allen. Daniel’s first wife Mary Safford was born about 1637 in Ipswich, Mass.. Her parents were Thomas SAFFORD and Elizabeth SUTTON. Mary died 16 Jun 1676 in Ipswich. Daniel’s second wife Elizabeth Black was born 1632 in Salem, Essex, Mass. She was married four times. Elizabeth died 29 Mar 1693 in Ipswich, Essex, Mass. Next she married 24 Sep 1658 in Ipswich, Essex, Mass to William Rayner (b. 1615 in England – d. 26 Oct 1672 in Marblehead, Essex, Mass). Third she married about 1673 to Henry Kimball (b.1615 – d. 1676) Henry was the son of our ancestors Richard KIMBALL and Ursula SCOTT. .
25 Dec 1679 – Daniel and Elizabeth conveyed to John Lambson the house that had belonged to the Gilberts and Raynors. It was in Ipswich on the north side of Boston Road as it enters into Wenham from Ipswich. The deed was acknowledged by Elizabeth Kilham, June 19, 1684 with Samuel Adams and Isaac Cummings as witnesses. Mary and Richard arrived in Wenham about 1649. Richard became a freeman and constable in 1653. Richard was a frequent member of the jury. In 1654 he failed to appear for jury duty because of the difficulty of coming over the ferry. He had a few problems. In 1658 he was fined for having drunk too much liquor and was sued for non-payment of a debt to Humphrey GRIFFIN. In 1661 he was fined for smoking in the street on the Sabbath and was involved in a property dispute with Walter Fairfield. In 1674 Richard, Elizabeth and their daughter Elizabeth were listed as members of the church. Richard testified for Daniel Kilham in a trespassing case. In 1675 Richard was a soldier in King Philip’s War. In 1676 Richard sold Richard Kimball 35 acres and Elizabeth gave up her dower rights to the property. Elizabeth died between 1676 and 1696 when Richard married Susanna More Dutch who was the daughter of Richard More and Christian Hunter. She was the widow of Captain Samuel Dutch of Salem. Richard died in Wenham on June 21, 1713 when he was 96 years old. After Richard died, his second wife Susanna married John Knowlton of Ipswich. John’s wife Hannah Pickworth was born 14 Oct 1638 in Salem, Essex, Mass. Her parents were John Pickworth and Anna Chandler. Hannah died 1682 in Wenham, Essex, Mass. Lot’s wife Hannah Goodale was born 6 Aug 1645 Salem Village, Mass. She was Lot’s first cousin Her parents were Robert GOODALE and Catherine KILHAM. Hannah died 1677 in Salem, Essex, Mass. In September 1684, John PEASE was appointed administrator of the estate of Lot Kilham a townsman of his while in Salem and one of the first persons it is said to have died in the new settlement of Enfield, Connecticut. Kilham was a “measurer” at Salem in 1637 and a goatkeeper in 1640. Austin and Alice were admitted to the Church at Dedham on 28 June 1640. He was made a Freeman on 2 Jun 1641. Austin Kilham, with his brother Daniel, emigrated from the Parish of Kilham, Yorkshire, England, the same year, and probably in company with the Fiskes. Both settled and were freemen in Wenham before 1645, and are presumed to be the ancestors of all New England families of that name. This entry was posted in 12th Generation, Immigrant - England, Line - Miller and tagged The Mary Anne 1637, Wenham Mass. Bookmark the permalink. John Don’t you mean William FISKE (1613 – 1654)was Alex’s 11th Great Grandfather; one of 2,048 in this generation of the Miller line. There was a Catherine Kellam baptized in Ropsley, Lincolnshire 20 or 21 Mar 1606, but her father was Rafe not Henry. I have made the updates. Is Rafe related to Henry? I just wanted to say this is incredible research! I am a descendant of John Killam> Samuel>John>Amasa and so on. This is incredibly helpful as I am very new to genealogy, and the first to start to research my family. I’m very curious to know why all the land holdings went to Lot and not John since he was the eldest son though. But I’ll try and dig that up. Thank you so much for all this work. Can I ask how you obtained it all? Thanks! I got much of this on ancestry.com My subscription has lapsed. Check the links at the bottom of this page. Do they still work?